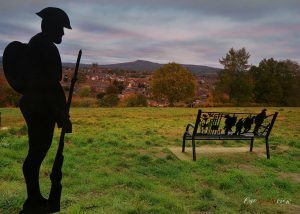 Friends of Whitcliffe Common Trustees have welcomed plans for the memorial soldier on Whitcliffe to return for a week each side of Remembrance Day but decided that having the silhouette there all year round would make it less special. Rick Summers said the soldier had been absolutely right to celebrate the centenary this year but would would lose its poignant effect if it was there all the year round. “We already have a permanent memorial bench and we should welcome the silhouette back into position for a week each side of Remembrance Day as well as look at any future special anniversaries.